This is a photograph from the Longford Athletics Club 5KM and 10KM Road Race which was held at The Mall, Templemichael Road (Longford Leisure Center), Longford Town, Ireland on Sunday 16th March 2014 at 11:00. 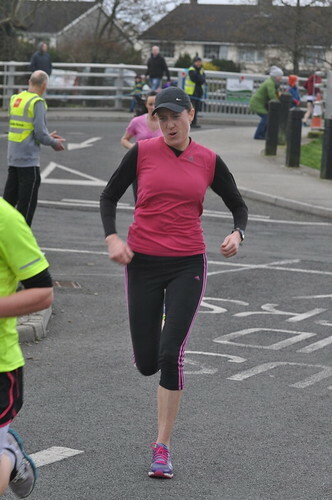 The race was organised in conjunction with Longford Sports Partnership and also featured a special 5KM race for Junior runners and joggers. The race was AAI approved and measured with chip timing provided for all participants. The race has expanded since last year with the addition of a 5KM option for participants. Reading on a Smartphone or tablet? Don't forget to scroll down further to read more about this and race and see important Internet links to other information about the race! Route Description: The 5KM race took one loop of the following course description whilst the 10KM simply repeated the loop a second time. The race started about 1/2 KM from the Sports Center on the link road to the N4: start (goo.gl/maps/3xaRb Google Streetview). The race then proceeds in a clock-wise direction onto the N4 Bypass (goo.gl/maps/jVv1e Google Streetview) for about 1KM. Then the race turns at the well known McDonald's Roundabout which will be known to anyone who has ran in the Longford Half or Full Marathon (McDonalds goo.gl/maps/6lFIF Google Streetview) and then follows the R198 towards the town center along Battery Road and Crosskeys, Church Street to Bridge Street crossing the Camlin River and then left onto Great Water Street returning back to Templemicheal and the finish area. The only climb on the course is the rise at the McDonald's Roundabout. On the By-pass participants were marshalled onto the walking path inside the hard shoulder. The race was organised in conjunction with Longford Sports Partnership which was established in 2008 under the auspices of Longford County Development Board. One of the key mission goals of Longford Sports Partnership is to increase participation in sport and physical recreation and ensure that local resources are used to best effect. The Partnership also help to ensure enhanced planning of sport at local level. This was a very well organised event and the members of Longford AC and the Sports Partnership deserve great credit for this. The running of the 5KM and 10KM races simultaneously worked very well. There were about 180 participants in both races combined. Refreshments were served in the Scouts Hall beside the Leisure Center after the race.